We asked our readers to share the most inappropriate presents they've gotten on Valentine's Day. You won't believe some of the things guys consider "gifts"
As a beauty editor, my inbox is always cluttered with emails about the latest beauty products. And as Valentine’s Day approaches, I’m getting a ton of emails about romantic, beauty-related gift ideas. But when I got a press release suggesting boyfriends give gift cards for a Brazilian wax as a “romantic gesture,” I about choked on my coffee. Then I read through it twice to make sure it wasn’t a joke. Nope, totally serious. “It’s really a no brainer for a guy — it’s like gifting himself, plus his girlfriend actually gets what she wants!” Um, how ’bout no? Click here to see some more really bad Valentine’s Day gift ideas. Think of the poor guy who actually does take this advice. He’s basically saying, “Hey, to celebrate this day ‘o love, I think you should pour hot wax all over your lady parts, then have your hair ripped out so I’ll find you more sexually attractive than I do now.” Romantic, isn’t it? Personally, this sounds like quite possibly the worst idea ever. But then again, there are some pretty clueless guys (and to be fair, girls too) out there. So I asked our Facebook fans to share the worst Valentine’s Day gifts they’ve ever gotten. There’s no way they could beat a waxing gift card … right? Scarily enough, they did. Diet pills? A bag of socks? Cleaning supplies?! These gifts were so inappropriate; I had to offer some better solutions for all the well-meaning, but totally off-base, guys out there. So if you’re that girl who loves getting something nice on Valentine’s Day (I don’t blame you, so do I), make sure you send this list to your significant other. Unlike the wax, this actually is a “no brainer”: you can laugh at these hilarious stories and prevent your own awful Valentine’s Day at the same time. 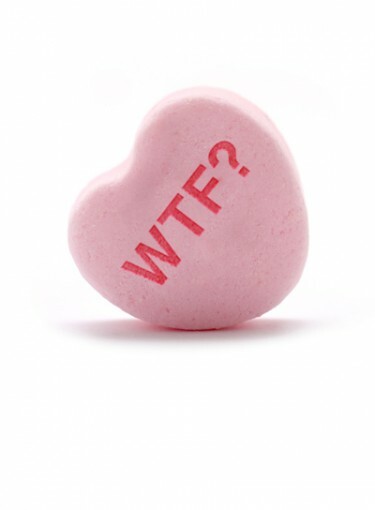 Click here to see the worst gifts our readers have gotten on V-Day.